Capcom makes an ambitious undertaking with this 2012 Open World Action-RPG. 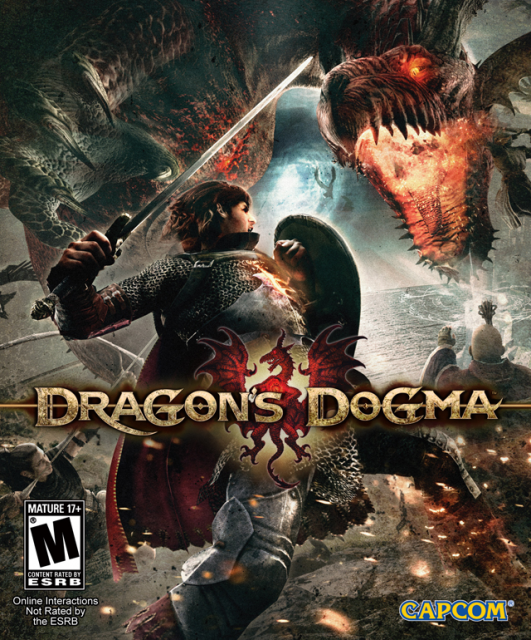 Dragon's Dogma is an open world action-RPG developed by Capcom for PS3 and Xbox 360. It is said to be the biggest and most expensive game they have ever produced. You play as the Arisen, a hero chosen by the Dragon who must fight their way through the medieval land of Gransys to reclaim their stolen heart. It is directed by Hideaki Itsuno who is well known for his work on another Capcom game franchise Devil May Cry. The plot of the game follows the tale of the Arisen, an orphan whose heart is stolen by a Dragon when it attacks the fishing village of Cassardis. Marked for a powerful destiny by the very same Dragon who attacked them, the Arisen recovers from their grievous wounds and finds they are now able to communicate with the Dragon itself. Challenged to take up arms to save their land the Arisen sets out on a massive quest to learn the mystery of the Dragon, how they are tied to it, and to reclaim their stolen heart. During your quest you will be free to roam the sprawling Kingdom of Gransys in search of your quarry. Along the way you will meet many important people of the realm, discover the hidden powers driving the world, and form your own band of adventurers with the help of the immortal Pawn Legion. The game features a climbing mechanic, much like Shadow of the Colossus, allowing players to scale larger enemies such as a Griffin or a Chimera. Doing so allows the player to strike at vital points which can be used to tactical advantage in combat. An example would be to slice off a Chimera's snake tail preventing it from breathing poison gas, or to pull a helmet off of a Cyclops leaving his eye vulnerable to attack. Some enemies can only be defeated by a hero brave enough to grab on, but do so at your own risk! In addition to the climbing mechanic players may also use a wide range of melee, ranged, and magic attacks. Each character is able to equip 6 skills based on their vocation and weapon choice, with 3 skills being related to your primary weapon and 3 to the secondary. A dagger and bow using Strider, for example, would have 3 skills that use his daggers and 3 skills related to his bow. Some example skills include bow shots that can rain arrows on enemies, a forward thrusting attack that resembles Dante's signature move the "Stinger", magic spells that can call down Meteors, and just about everything in between. Skills will become available as you level up, but must still be unlocked by spending Discipline Points, which are gained in a similar way to experience. Dragon's Dogma also includes many standard features of the RPG genre including crafting, gathering, a party system, wandering NPC quest givers, affinity ratings with important characters, and so on. However it does it in a highly dynamic world environment with a full day/night cycle that is not merely for show. Depending on when and how an area is approached the game can vary wildly. What is a simple shack in a mountain pass populated by a few villagers can become a bandit hideout after the sun goes down, there are also rare items and enemies that only appear at night. Illumination can become a very important commodity as well, the last thing an Arisen wants is to wander into the woods one evening without their lantern only to find themselves surrounded by Zombies they couldn't see. A Rift Stone is used to summon Pawns. The pawn system allows players to recruit up to three NPC assistants at a time. One of your Pawns is known as the "Main Pawn". Unlike your other team mates they are fully customizable, level as you do, and are able to switch classes and skills just like the Arisen. They serve as your constant right hand man sticking with you through the entirety of the game and never leaving your party. The game's online functionality allows you to recruit other players' main pawns as temporary allies as well as allowing others to recruit yours. This makes way for a passive co-op system where friends can use each others pawns to trade items and help each other out by teaching their companions important quest details or how to fight specific monsters, all of which is info the Pawn's retain in their original world. The game also features social media integration that will allow you to take in game screenshots and advertise your Main Pawn for others to see. This extends to an in game system as well where you can rate other players pawns on a number of criteria such as how helpful they were or how cool they looked and even lets you search and favorite pawns you like for later use. The game also allows you to give a pawn being sent off one item as a gift to its owner if you found the pawn especially useful. Those without online or who want to simply opt out need not worry though. The game also has many wandering sometimes called "Straight Pawns" that will appear in all game worlds. These can be recruited simply by engaging them in conversation and recruiting them the old fashioned way. The key to success in the world of Dragon's Dogma will rely on correct use and regular upgrading of your pawns! Remember only the main pawn levels with the Arisen so switching out the secondary pawns from time to time is a must. Be careful when recruiting though, if you try to hire someone far more powerful than your Arisen you will have to pay a sizable bounty in Rift Crystals. These can be found not only on your in game adventures but also by your Main Pawn when they are recruited into another players world. However those looking for a cheap ally need only hire a pawn that is equal or lower in level than themselves and they will need not pay a recruitment fee. Additionally, pawns made by people on your friend's list are free to hire no matter their level. There are 9 classes commonly called "Vocations" in the world of Dragon's Dogma. These are split into three groups: Base Vocations, Advanced Vocations, and Hybrid Vocations. It is important to note that only the Arisen can become one of the three Hybrid Vocations and Pawns are limited to the Base and Advanced groups. The Fighter is a master of melee arts and defensive combat. Specifically they specialize in the use of sword and shield while wearing heavy armors. They serve as the backbone of the party by using skills to draw enemy attention, grapple foes and holding them prone so team mates can take tactical advantage, and mixing it up with enemies in the thick of things so ranged combatants can fire away without hassle. They are particularly handy to have against flying enemies as they have the skill to project others into the air to grab on to hard to reach opponents. Don't let their appearance fool you though, a fighter can be very mobile on the battlefield and well timed blocks with their shield enable to deliver vicious counter attacks. Dumb, slow brutes they are not. The Strider is a combatant with a varied and versatile approach. Able to do battle both in melee with a pair of dual daggers and at range with bows, there is no fight the Strider is not equipped to handle. Unlike the Fighter who focuses their defense on use of a shield, a Strider can be quick on their feet and is capable of an evasive dodge roll. This can be very handy at getting them out of tight spots and also placing them in position for one of many trick shots they can perform such as firing multiple arrow barrages, pinning targets to walls, or slamming single shots with deadly accuracy into enemy weak points. However one of their greatest skills comes into focus against the huge monsters of Gransys, for no Vocation is more skilled at climbing than the Strider. A veritable genius of strategy and battlefield control, a Mage can make or break the outcome of any fight. More than just purveyors of fireballs they also have powerful enhancement spells that can bless party members weapons with elemental properties. Of course they also serve as the ultimate field medics with potent healing spells that can create fields of energy healing multiple allies at a time. While Mages lack the defensive abilities of their brethren Base Vocations, they make up for it with their own Levitation magic which can allow them to safely traverse terrain others would find impossible. Of course they are also armed with walls of fire, huge blades of ice, and whips made of lightening making them quite feared in combat. The Warrior represents the peak of a Fighters training and the ultimate Vocation for those wishing to be dominant forces of pure physical wrath in combat. Wearing only the heaviest, most durable armors and being the only Vocation capable of wielding massive two-handed weapons, there is no one better at dealing massive damage in the most personal way possible. There are, however, drawbacks to those who seek the path of the Warrior: focused only on pure attack power, they lose some of the versatility of a Fighter and have sworn off the use of shields. Despite those drawbacks, they gain a greater variety of skills that allow them to damage foes, such as cutting the legs out from entire groups or crushing them into the dirt with devastating downward blows. In raw battle no one stands taller or stronger than the Warrior after all. The Ranger is similar to the Strider in many ways, but is much more specialized. Archers of the finest caliber, only Rangers may wield the massive longbows they are known for. With these larger ranged weapons they can fire enough arrows to darken the sky with a single barrage and shoot down entire waves of rushing enemies. Woe be to the largest of monsters as well for the focused power of a Rangers arrow is equal to that of a ballista and no one is better at exploiting an enemies weak point from range. Like all Advanced Vocations there is a draw back though. Sadly the intense focus required to master the longbow leaves little to no time for skills with the dagger so they are no more skilled in melee than a Strider. Fortunately they still retain superb evasive skills and climbing technique when needed. True wrath and ruin know only one equal and that is the unmitigated magical power of the Sorcerer. Where the Mage dabbled in many different arts the Sorcerer has sworn off what they feel are lesser schools of magic to instead advance pure arcane power. Capable of causing untold destruction, a Sorcerer can project massive towers of ice, create entire walls of coruscating flame, and call down meteors from the sky to obliterate anything foolish enough not to run. Of course this focus of study comes at a cost. The Sorcerer chooses to abandon healing arts, can no longer recover their allies, and does not gain more advanced enhancement magic like Mages do. While their attacks are also truly without equal they also require far more time to prepare. A Sorcerer without allies is as helpless as a baby. The Assassin is an absolute dynamo with all physical arts who also possesses a potent arsenal of tools designed to kill. With all the training of both Fighters and Striders, the Assassin finds itself armed for literally almost all scenarios and has more available equipment options than any other Vocation. Proficient with both a shield and the evasive skills of the Strider, the Assassin's defensive skills are equally robust. However they not only rely on old skills, but have also mastered the use of explosive charges, poisons they can apply to their weapons, and are even able to perform incredibly fast counter attacks that can instantly kill weaker foes. Despite lacking all magical training there is no situation an Assassin can not thrive in as they are unequaled in the art of killing. The Mystic Knight is a conglomeration of the soldiering skills of a Fighter and the magical prowess of the Mage. Considered to be the ultimate team player the Mystic Knight can easily become the back bone of their party. They are capable of wielding special shields that can be imbued with enchantments and can empower their entire party with one spell. With the ability to leap into the air and make stunning charge attacks, create spheres of magic and use their weapon to send them flying at enemies, and cause devastating explosions on perfectly timed blocks with their shields, the Mystic Knight is deadly at both melee and range. Heavily armored, able to attack from any range, and a powerful party supporter, the Mystic Knight can lead any group to success no matter the odds. Magick Archers take their craft to a level beyond perfection through use of the arcane. Unlike the Ranger who focused on the bow, the Magick Archer took the time to branch out into the arts of Mages. With the powers they learned, they are able to fire arrows made of pure ethereal energy. No longer hampered by what is only possible in the physical world, Magick Archers can fire arrows that split into multiple bolts, lock onto an opponents weak points, fire shots that simply can not miss, and unleash arrows charged with elemental powers. However while they still do maintain some basic skills with daggers they are not well suited to melee and can find themselves in quite the pickle if pinned in. Yet with a bow and the range to use it, a Magick Archer is no less than a god, and woe be to the object of their wrath. There are many different things that go into the development of your Arisen and Main Pawn in Dragon's Dogma. First off is character creation itself. This seems like a fairly straight forward process, and in many ways it is, but there is far more to it than cosmetic appearance. Character size, weight, and body types all play a small role in determining how your characters will handle in Gransys. Taller characters will have greater reach and weapons scale to the size of the player, meaning a taller character will have greater weapon reach and be able to perform a grab from slightly farther away. Weight also plays a factor, heavier characters are believed to have slight bonuses to carrying capacity and resistance to "force" attacks like strong winds or being tossed off a monster. Meanwhile lighter characters will move slightly faster, use less stamina per action, and regenerate stamina quicker. Shorter characters also have an advantage in that your players hitbox is also sized based so a smaller character will be slightly harder to hit than a large one. Just remember these are slight things, a chubby character won't feel useless as a Strider so don't be afraid to overlook the metagame in favor of playing exactly what you want. So now that you have a character made just how you want them, so what determines how strong that character is? First every character has base stats which are determined by character level. Character level is increased by questing, slaying monsters and other ner do-wells, and making progress in the overall story of Dragon's Dogma all of which earns you EXP. Second is Vocation level which is equally if not more so important. Each Vocation will have it's own independent level per character, so a Arisen might by level 15, Fighter Vocation level 5, Mage Vocation level 3. Vocation level is increased by earning Discipline points while you play as that Vocation. The key difference is Discipline points are banked and useable as a commodity at the Inn in Gran Soren the capitol of Gransys. We will go more into what they are used for later. Next is Vocations themselves. While your Secondary Pawns vocations are locked both the Arisen and Main Pawn will gain the ability to change Vocation very early in the game. This is a good thing because it means you are never locked into one play style and you will have room to make a character tooled to your personal style. First though we need to know what makes Vocation choice important. Each Vocation has it's own playstyle obviously but they each also have specific skills tied to the weapons they use, class Core Skills, and special Augments. When a Vocation is first begun it also starts at level 1, as the Vocation levels up more and more of these different skills open up. So to see some of the best skills in the game you will have to stick with a Vocation for some time to level it up! Fret not though... many skills are usable by multiple Vocations once they are learned, just remember a weapon skill will only work with weapons of that type or a compatible one. For example you cant use a dagger style attack while using a sword but you can use many spells learned from the regular staff skill set when using an Archistaff. The bulk of the score was composed by Tadayoshi Makino with a few pieces composed by fellow Fallout 3 and Dragon Age composer, Inon Zur.